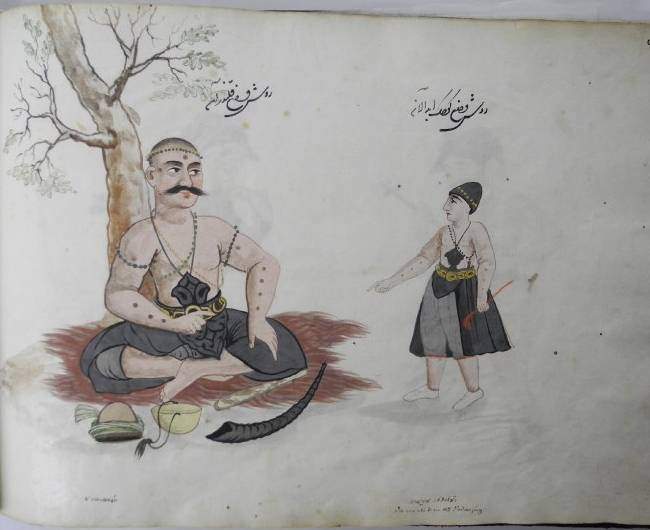 007 literature scene depicting Laila tending to an emaciated Majnum. 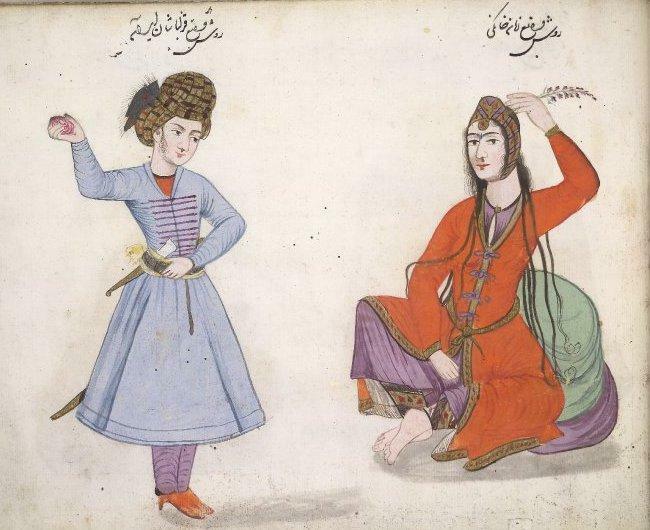 Majnum, covered by only a cloth around his waist, lays upon Laila, gazing up at her. Laila, dressed in printed jacket, skirt, and pants, sits cross-legged, supported Majnum. Surrounding them rests a dog, lion, gazelle, and rabbit. 008 a palace usher (right) and a royal bodyguard (left). Usher stands, legs widely separated, holding an axe-like object in one while resting his other hand upon the sash tied around his waist. Opposite stands the royal bodyguard, leaning against a long cane held in one hand, while the other plays with his moustache. The bodyguard is dressed in a long robe with an elaborate, feathered headdress. 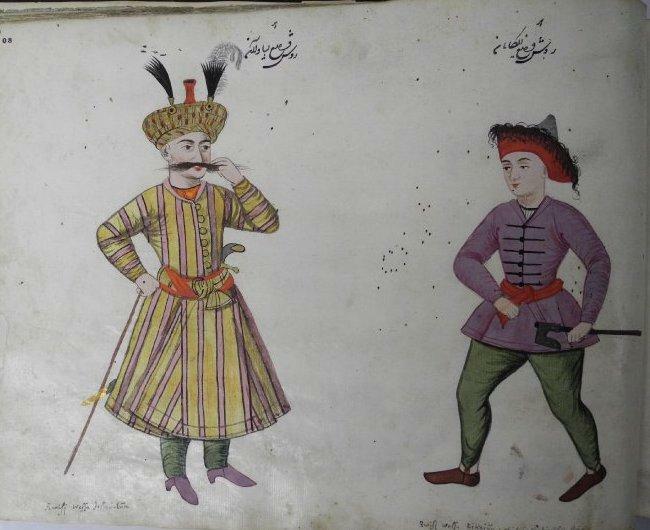 [See Picture 98 from the Ralamb album for a figure with a similar hat to the royal bodyguard] [The usher may be the equivalent of the Ottoman Peik]. 009 a royal bodyguard and a musketeer. 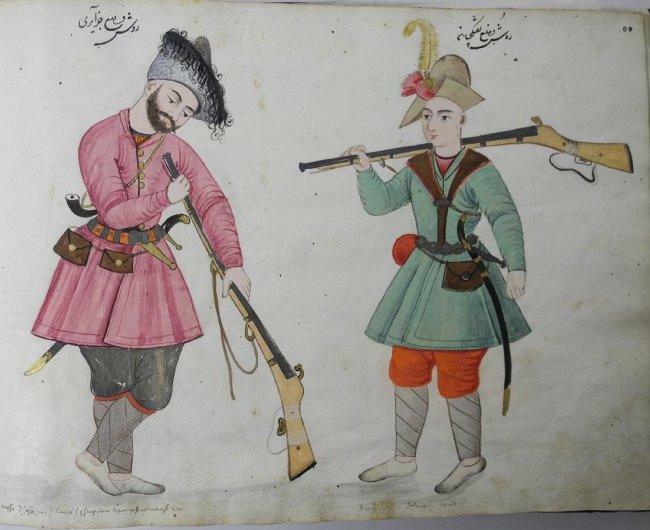 The bearded bodyguard stands, legs crossed, with eyes cast downwards while resting upon his long musket. Small bags and a dagger hang from the sash tied around his waist. The musketeer stands opposite, with his equally long musket slung over his shoulder. A long sword and purse hang from his tied sash, while a feather protrudes from his hat. 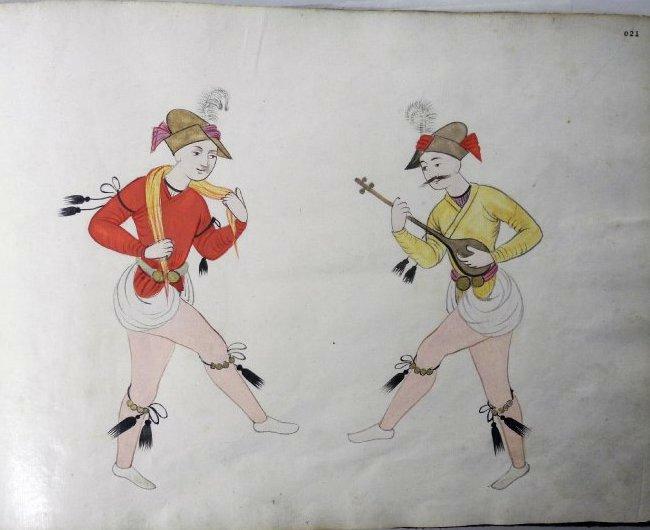 010 an Indian (left) facing a Turk (right). Indian wears a long dress over pants, with a dagger and two swords (long and short) tucked into the sash tied around his waist. In one hand he holds a piece of food close to his mouth. Opposite the Turk wears a long coat over his shoulders, covering his long dress and pants. In his hand he holds a slender pipe. 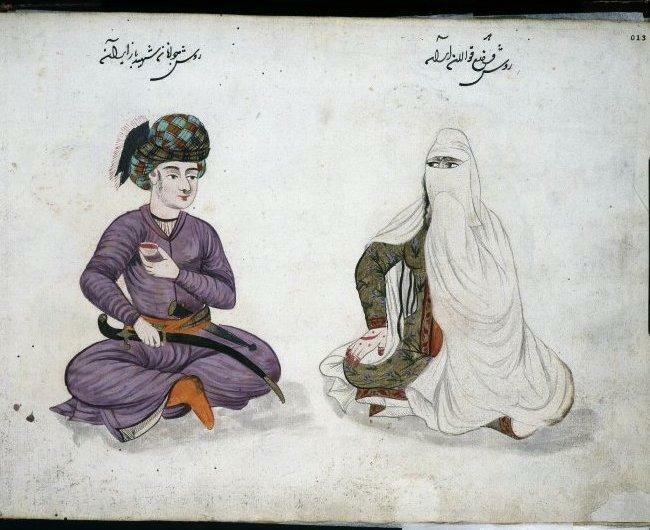 011 a Persian mullah sits cross-legged opposite a bazaar prostitute. 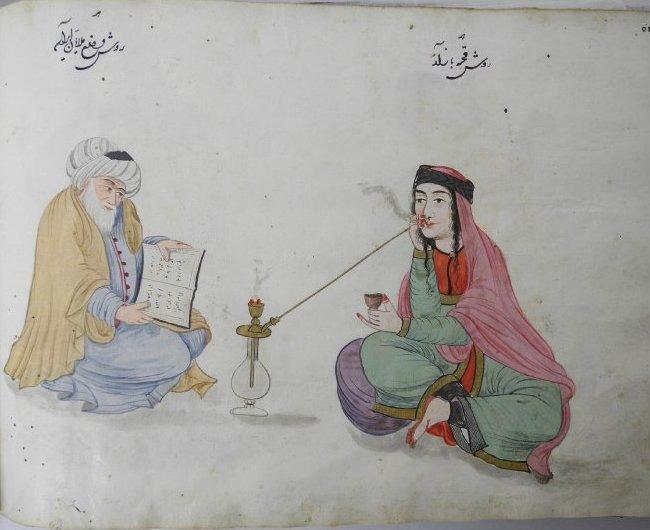 An open book lies on the mullah's lap, as he strongly gazes towards the ambivalent lady smoking from a water pipe. The prostitute wears long robes that cover both her hair and body, with painted fingers and feet. She smokes the pipe in one hand, while holding a small cup in the other. 012 a Persian qizilbash and a woman. The recreational scene depicts a standing man, with one hand placed upon his sash (dagger tucked into his side) while the other holds a flower head (arm extended towards her face). The man gazes towards the woman, seated opposite upon cushions while placing a strand of flowers into her hair. 013 two storytellers. A man sits cross-legged, holding a small cup in one hand while the other gently clasps his sword, resting upon his legs. A dagger is tucked into the sash tied around his waist. The man gazes directly towards the covered lady sitting opposite. The woman's eyes are visible, while the rest of her face, hair, and body remain covered underneath layers of robes. Her one visible hand is painted, while the other gestures towards her mouth (covered under a robe). 014 a man and woman from Bukhara. 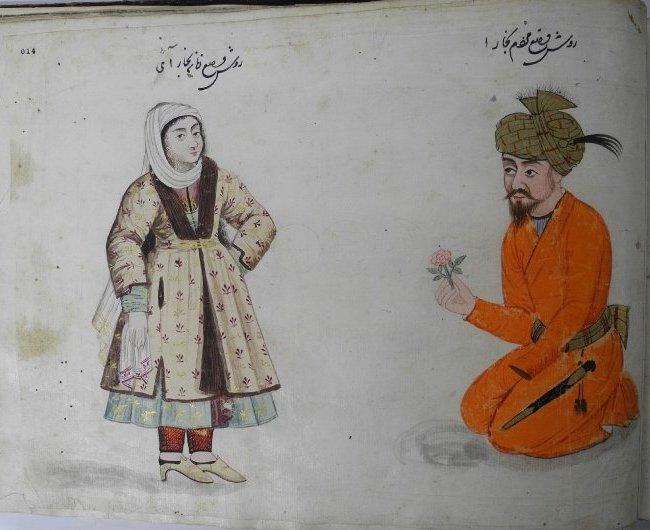 The man (right) kneels while presenting the lady (opposite to the left) a flower. The bearded man wears a turban (feather protruding), has a dagger hanging from the sash tied around his waist, and only one hand. The lady, gazing ambivalently towards the viewer, wears a long coat over dress and pants, with hair covered by a long shawl. 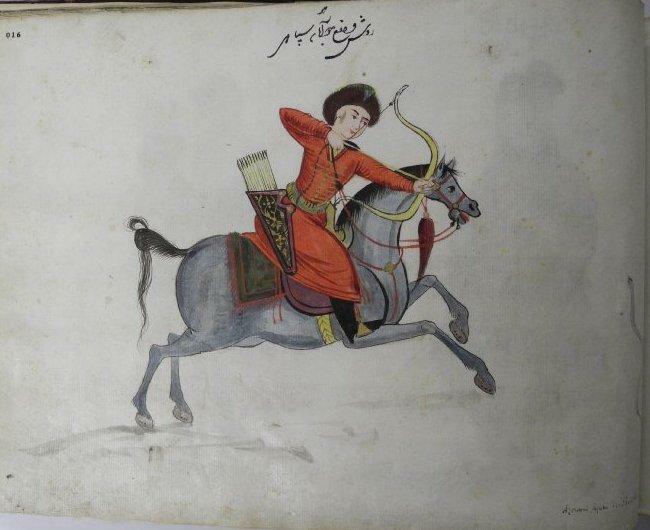 016 a cavalryman (on horseback) aiming his bow and arrow towards a snake. 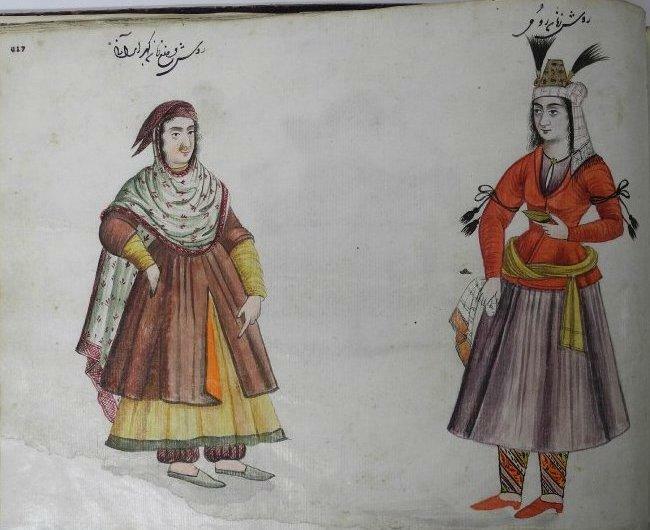 017 a Zoroastrian woman (left) facing opposite a Turkish woman (right). Turkish woman holds a small bowl in one hand, while gently clasping a cloth in the other. She wears a small feathered cap, with a sash wrapped underneath, with a jacket, skirt, pants, and sash tied around her waist. Opposite stands the Zoroastrian woman dressed in long jacket, covering her skirt and pants, with a printed shawl wrapped around her hair, shoulders, and extending down her back. She wears a large nose-ring and fitted cap. 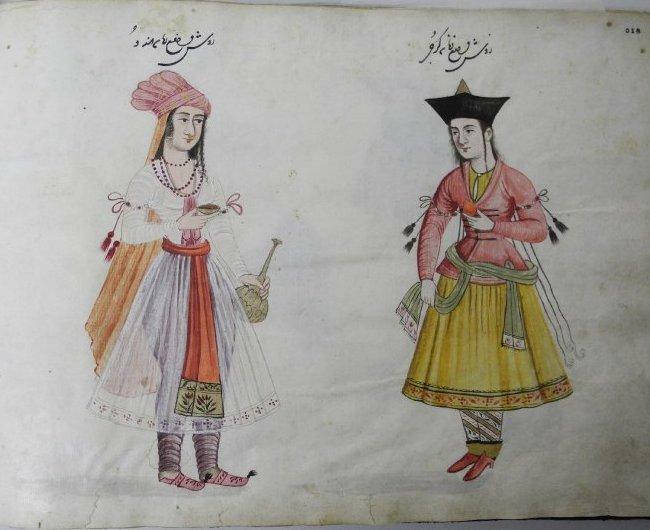 018 an Indian woman (left) facing opposite a Georgian woman (right). Indian woman holds a small, shallow cup in one hand an a large vessel in the other. A turban wraps around her head, with a long shawl extending towards the ground. Three strands of beads hang from her neck, while a translucent skirt drapes over her pants, tied at her waist by a long sash. The Georgian woman holds a piece of fruit (unidentifiable) in one hand, while the other clutches her sash, tied around her waist. She wears a triangular shaped hat, jacket, skirt, pants, and heeled-shoes. 019 competition between two wrestlers with trainer watching. 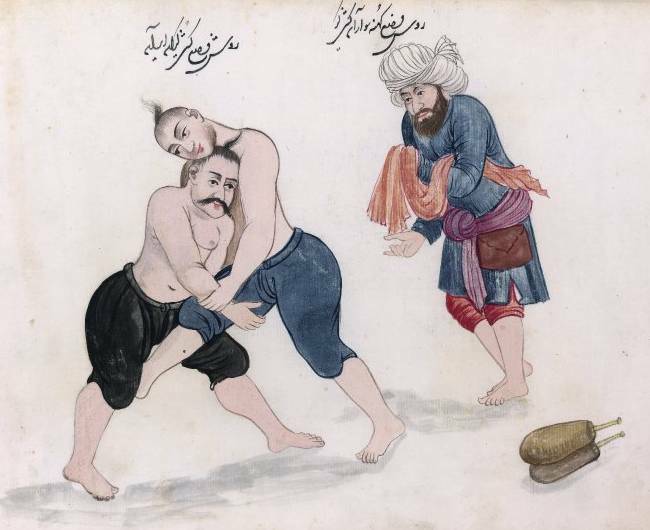 To the left the wrestlers are entangled, bare chested, shaved heads, and shoeless, while the fully clothed trainer stands aside, holding a cloth in one arm. A purse hangs from the sash tied around his waist, while a large turban covers his head. 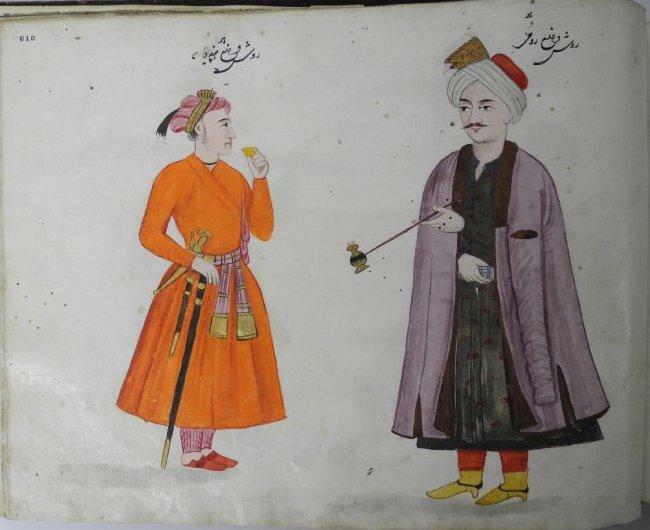 020 an enlarged qalander (an itinerant Sufi who learns and teaches during his travels) speaking to a young devotee. The qalander, bare chested with strings of beads hanging around his neck, rests against a tree with his belongings (hat, bowl, stick, and reeded musical instrument) placed in front. To the right a devotee, dressed similarly, stands in profile with his hand pointed towards the qalander. 021 two men dancing. Right man plays a stringed instrument while the other (facing directly opposite) holds the scarf hung around his neck. Both men are dressed in short cloth (revealing their legs) with decorations tied below each knee. Feathered hats adorn their heads. 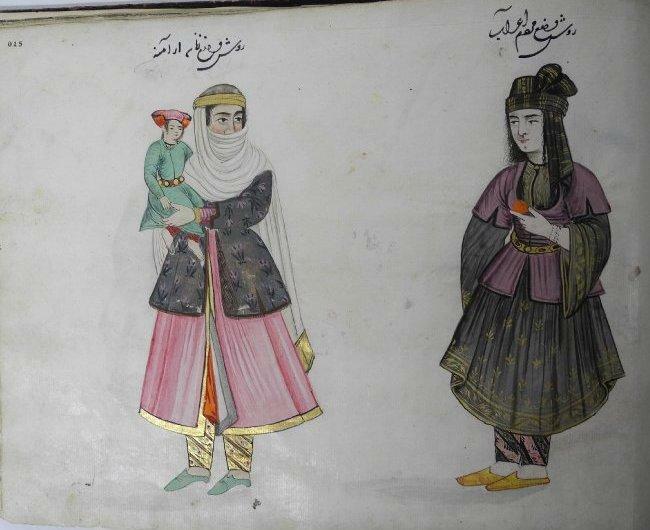 025 an Armenian woman, carrying a small boy, standing opposite a man from Bukhara. The woman wears a long shawl covering her hair and face (eyes revealed) with a printed jacket over skirt and pants. In her arms she carries a child, dressed in long coat and pants with hat. Opposite stands a man dressed in short coat, long dress, and pants with turban tied elegantly around his head. He holds a small, orange object (presumably a piece of fruit) in one hand, held by his waist. Both figures stare directly at one another. 034 two rams fighting (horns hooked) while two men eagerly watch on either side. 038 five Iraqi men and dog surrounding a performing goat. 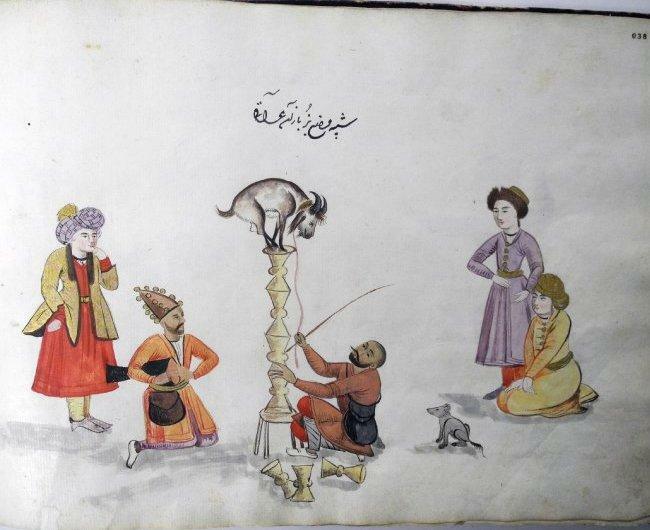 One man kneels playing a drum, while another sits beside a column of stacked drums (presumably) with a goat balancing on top. Three other men gaze upon the event from either side. 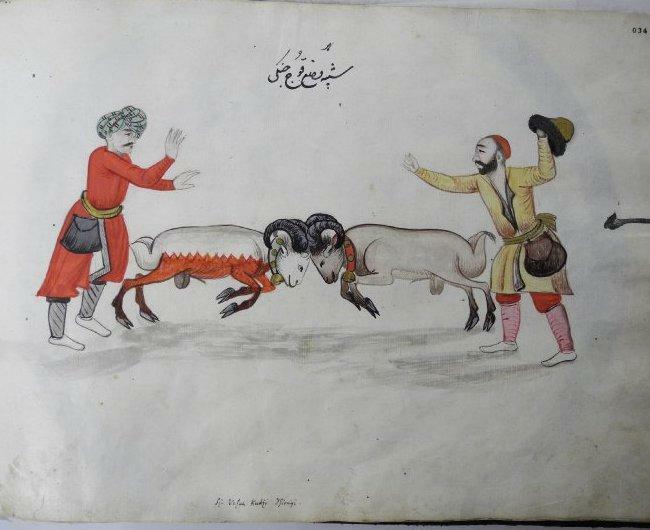 039 two Iraqi men actively encouraging a fight between two goats. 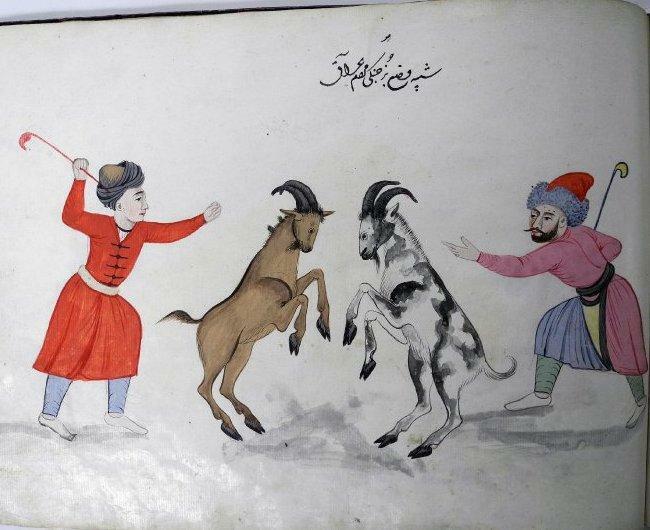 Both goats stand on hind legs, facing one another while the men stand on either side waving whips. Images with only animals and the 2 maps are not included here. Picture source: The British Museum. 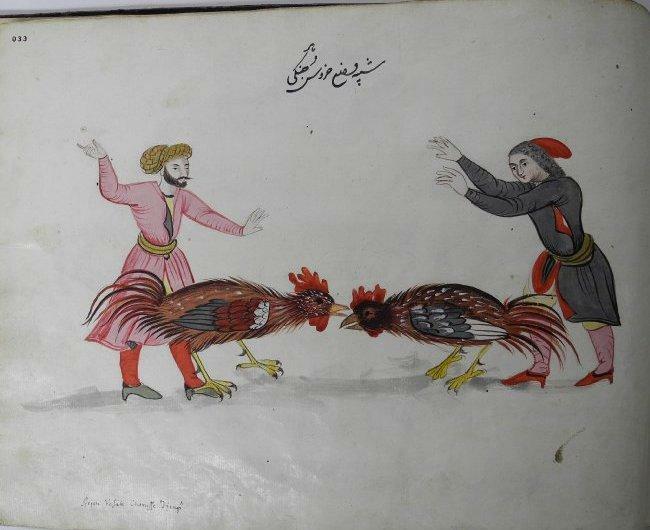 This was originally the Sloane MS. 2925.